We’ve talked about torque and tension before, and why it’s important to understand that you must achieve the proper tension when installing structural bolts. Fortunately, there are special structural bolting components on the market that can make it easier to ensure proper torque and tension. Tension control (TC) bolts come built with a spline that pops off when the nut is properly torqued. For hex bolts, DTI washers can be just as helpful in displaying the proper tension. Two of the four methods of installing structural bolts cover tension control (twist-off type bolts) and DTI washers, respectively. Let’s look at these two components and how they’re helping workers on the jobsite every day. Tension control bolts are pre-assembled fasteners with a rounded head and a splined end that shears off when the nut achieves proper torque. This is a great advantage to using TC bolts, as it provides a quick installation procedure that maintains accuracy. TC bolts are also faster to install for this reason. It is still important to remember that though TC bolts help confirm that you have achieved proper torque, you still need to ensure your bolts are properly tensioned. Direct tension indicators (DTI) are washers manufactured by Applied Bolting Technology and Turnasure. These washers are used on a hex assembly and are designed to ensure proper tension on bolts. There are two types of DTIs, both resulting in the same outcome. Traditional DTIs have bumps around the washer that flatten once proper tension is achieved. This allows you to have a visual confirmation that tension is achieved. The other type of DTI, also made by ABT, are DTI Squirters®. When properly tensioned, these washers will squirt out a colored silicone that gives you a visual confirmation that tension has been achieved. An extra advantage to this is that inspectors can easily see the bolts were installed properly, saving time on the jobsite. Both tension control bolts and DTI washers can help save you time on the jobsite by easily confirming tension or torque is achieved. Regardless of what you use, remember that bolts are tightened in order to achieve tension – torque is only a by-product of this relationship to reach proper tension. Picture it: you receive your order of hot-dip galvanized structural nuts, open the container, and see that the nuts are blue. There must be a mistake. Aren’t hot-dipped nuts supposed to be green? That’s not always the case. Let’s go over dyes and why the color of the structural nut may not be what you were expecting. Why are Structural Nuts Dyed? While there’s no requirement that the lubricant should be dyed, many manufacturers put colored dye into the lubricant to easily distinguish the structural nuts. Because there is no set standard, different manufacturers use different colors for each kind of structural nut. Though you may be used to hot-dip galvanized nuts being green and mechanical galvanized nuts being blue, this can be the opposite for different companies. Some companies will use an entirely different color at their discretion. The colors are not present for the purpose of the customer, but for the manufacturer’s organization. Do I Have the Correct Structural Nuts? Nine times out of ten, yes, you received the correct structural nuts. The best way to tell the difference in a hot-dip galvanized and a mechanical galvanized nut is by feel. 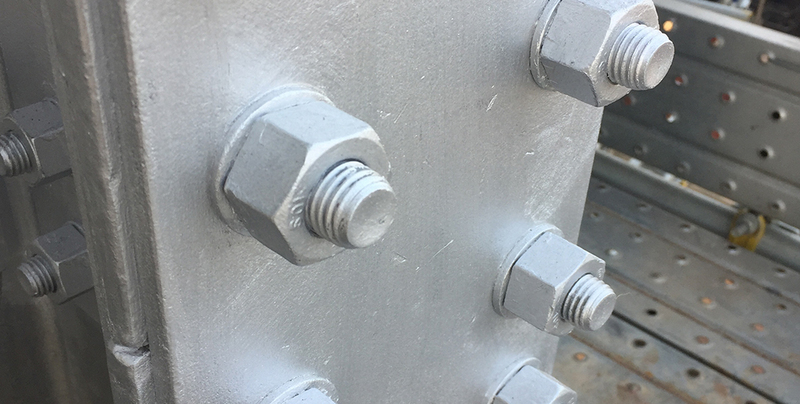 Hot-dip galvanized structural nuts will feel grittier, while mechanical galvanized nuts will feel smoother. That said, if you are still unable to tell the difference, our sales representatives are more than happy to assist you in ensuring you received the correct order. The colored dye in the lubricant on the structural nut serves two purposes: it shows that the nut is covered in the lubricant, and it helps the manufacturer keep each type of nut separate and organized. Different manufacturers use different colors to signify types of coatings, so it can get confusing if you are used to one color, and you receive another. You can usually confirm you received the right nuts by feeling the coating. Structural bolt stickout is just what it sounds like – it’s the amount of threads protruding beyond the nut after installation. While the RCSC does specify a minimum for bolt stickout, they do not specify a maximum. That being said, there are risks to consider with too much bolt stickout. Here, we’ll go over the requirements, risks, and best practices regarding structural bolt stickout. The RCSC requires that the end of the bolt must, at minimum, be flush with the outer face of the nut. The nut may not be hanging off the end of the bolt after tightening is completed. When the outer face of the nut is flush with the end of the bolt, the bolt’s ductility is at its greatest. This is because the maximum amount of threads are exposed, allowing the bolt to stretch as much as possible. Calibrated Wrench or Twist-Off Methods: The bolt will not be properly pretensioned, due to the nut ceasing rotation, while the torque remains high. This causes the bolt to remain loose. Turn-of-Nut Method: The required turns cannot be applied. Direct Tension Indicator (DTI) Method: The gap requirements will not be met. There is also a risk of thread stripping with bolt stickout. During pretensioning, the bolt will stretch, reducing the thread contact between the bolt and the nut. Acceptable bolt stickout is established by the bolt and nut combination. Below is a chart that details general guidelines for acceptable bolt stickout. Note that any protrusion beyond these guidelines may still be suitable. For information on choosing the correct nuts for our F3125 structural bolts, please see the chart below. If you have any additional questions, contact our sales team.